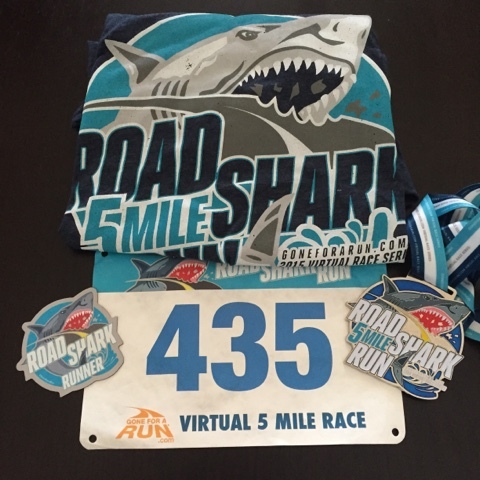 Running with SD Mom: Race Recap: Virtual #RoadShark5miler Recap! Remember when I told you about this virtual 5 miler thru Gone for a Run?! Well, it was supposed to be completed between July 31 and August 2. I did the run on Friday July 31st and then left for vacation. (More, lots more to come on that!) So, this is the first chance I have had to get my recap out to you! The most fun part was that my dear friends Kim and Robin did the run virtually with me too! Virtual races are fun. 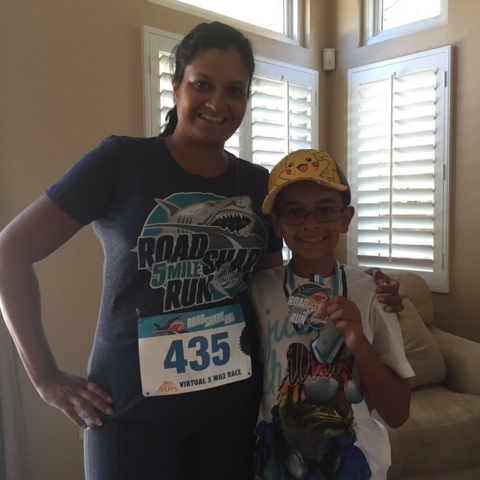 You get to wear a bib and the race shirt ad then reward yourself with a medal after the run! This one was a fun one. I love the 5 mile distance and I even got a "cool shirt" yell while I was running! Someone tell D this medal does NOT belong to him! But let's talk about the awesome shwag! You get a real bib with a real number. You get a super high quality medal. Big with a pretty ribbon. You get a race shirt in women's and men's specific sizes. They even threw in a cool Road Shark Runner magnet! I cannot wait to do the next virtual run with Gone for a Run! I love their swag and their medals are awesome! Have you ever done a virtual run? Will you do the next one with me?! Announcement coming tomorrow for the next Virtual Run from Gone for a Run! Virtual races with friends is the absolute best! Cant wait to run the sole sister 7 miler at the end of the month! And I can't wait to run it with you! I do like to throw a fun virtual run in every now and then- making the training program a little more fun! That is a super cute shirt too! Wait until you see the Sole Sister tank1 Love it even more!